One of the perks of being a LARS rigger is being able to experience some of the finest views in the United Kingdom. These photos were taken from the iconic Crystal Palace Tower in South London. The tower itself was built in the mid-1950s among the ruins of the original Crystal Palace, which was tragically destroyed by fire in 1936, and to this day remains the main transmitter for the London area. Serving Greater London and the Home Counties, it is estimated that around twelve million people rely on its output, reaching homes in South and East Essex, North Kent, Surrey, Hertfordshire, Buckinghamshire and Berkshire. In fact, some fringe reception is also available in Oxfordshire and Sussex. Standing at an impressive 219 metres, until 1991 it was the tallest structure in London, before the construction of One Canada Square in Canary Wharf (235 metres). Nowadays it also looks up to The Shard (309.6 metres), the Heron Tower (230 metres) and the Cheesegrater – or Leadenhall Building (225 metres). 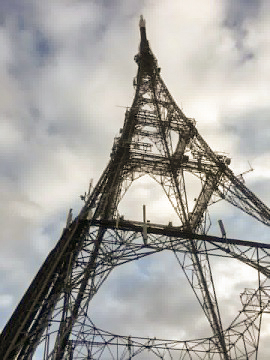 The work recently carried out on the Arqiva Crystal Palace Tower is part of an ongoing nationwide rigging contract. Travelling the length and breadth of the country, LARS riggers have installed over seven hundred links so far on this project alone. Climbing these masts as part of the day job might not be everybody’s cup of tea, but having installed links in some of the most stunning areas of the UK, our LARS riggers have enjoyed views many of us will never get to see. The tower, along with the tower at Beulah Hill in Croydon, has been dubbed the Eiffel Tower of South London, due to its shape. Although it is over one hundred metres smaller than the world famous Parisian landmark, the similarities are obvious, as it uses the same lattice structure; in fact, the Crystal Palace Tower is unique for being the tallest, free-standing lattice transmitting structure in the UK. The reason for being an Eiffel Tower lookalike was down to planning permission. The transmitting station had to be confined to a small area of Crystal Palace Park so that its impact on public amenities was minimised, while needing to be suitably easy on the eye. And so it was decided that a self-supporting tower would be erected, instead of the usual stayed-mast. The Crystal Palace Tower was opened by the BBC on 28 March 1956, replacing the original London television transmitter at Alexandra Palace in North London, famous for broadcasting the world’s first regular television service in 1936. As the popularity of television grew, so did the need to reach more homes. With its increased aerial height, the Crystal Palace Tower was able to provide significantly improved coverage, and in November 1956, the BBC ran its first colour transmissions from Crystal Palace. Nowadays, the tower has become so much more than just a television transmitter. It is now home to many of the phone companies, hence the need for the LARS rigging teams to install upgraded links, as our need for super-fast information at the click of a button grows. All LARS riggers are either MATS or Arqiva approved and qualified for High Structure Tower Access and High Structure Tower Rescue, Rooftop, RF Training and First Aid.